A report released this month sheds even more light on one of the alarming outcomes of the No Child Left Behind Act (NCLB): how it has contributed to the School-to-Prison Pipeline. The School-to-Prison Pipeline is defined as the result of the zero-tolerance policy of NCLB, which criminalizes wide-ranging misbehavior and has resulted in an explosion of referrals and placements in the criminal justice system, rather than these cases staying within the schools' disciplinary system. Prioritizing punishment over a right to education, this tendency mostly affects students of color and students with disabilities. Clearly, this path has hard-to-reverse consequences. The report lists clear ways NCLB has contributed to the school-to-prison pipeline. The focus on standardized tests has resulted in low-performing students being transferred to alternative schools or encouraged to drop out or enroll in a GED program. Evidently, the focus has also affected the curricula of schools, where more time is spent on test preparation. Oddly, but most significantly, the race to better test scores has resulted in more police presence in schools, and otherwise expected disciplinary problems have become matters of criminality. If the threat of punishment is supposed to frighten students into performing better, thus boosting graduation rates, that too has failed. Graduation rates across the U.S. are at their lowest since 2000-01, the year NCLB was passed by Congress (although it wasn't enacted until 2003). Along race lines, the statistics are downright appalling (but perhaps follow the increasingly prominent racist undercurrent in U.S. culture?). African-American students are three to three-and-half times more likely to be suspended or expelled than white students. With little support for reintegration, these punishments often become conduits to the pipeline. To read more about the report and the steps the authors' find necessary to dismantle the School-to-Prison Pipeline, click here. To read a report released last year, also by the Advancement Project, that explores the same topic, click here. To read the ACLU's fact page about the pipeline, click here. And to learn about Dignity in Schools, an organization dedicated to challenging the educational system's policy of zero-tolerance, punishment and "push out," click here. 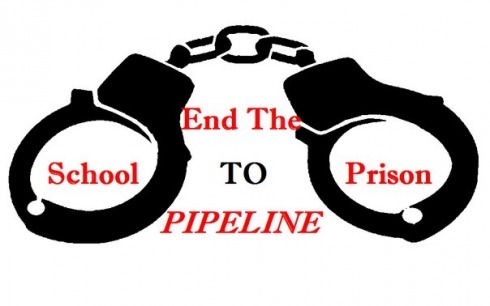 Image credit: Peer to Youth Enterprises, a website criticizing Baltimore's simultaneous cuts in education spending and the construction of three new juvenile detention centers. Labels: activism, corporate issues, education, politics, U.S. This was a piece of doomed legislation from the beginning to anyone who knows anything about the school system. Unfortunately policymakers seem to have no clue what happens in schools. I think your blog is pretty cool. I run a website www.myshortnews.org and was wandering if you would like to do a link swap?